‘Picasso in Pink’ is a stunning variety. Where it is on the market it show up well in displays. With its striking coloured flowers it really stands out from surrounding displays in gardens and pots. 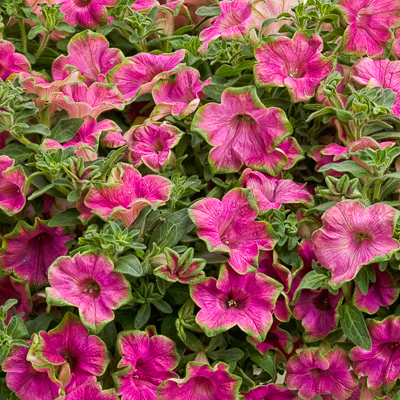 Like all petunias it is fast growing , well suited to larger pots and hanging baskets. Growing into more of a mound the ‘Pretty Much Picasso’ this plant forms a dense flowering mass of colour. Plant ‘Picasso in Pink’ at 30cm centres for good cover in sunny gardens. The bright pink flowers surrounded by a lime green edging is dramatic. The plant is self-cleaning with fresh flowers covering over older ones. ‘Picasso in Pink’ is ideal for gardeners who like a good show in their garden with minimum effort. The plant needs care as it establishes but once it is growing there is little after care needed to produce a good show of flower. In large pots around the garden, near pools or barbecues, on balconies and on sunny courtyards the plant will give a good show. The use of ‘Picasso in Pink’ in mixed plantings is worthwhile but the companion plants must be well rooted and strong growers. Look under care for instructions on ways to prolong the longer life of your plants. ‘Picasso in Pink’ is an easy plant to grow and maintain. Watering needs are average. When dry, water the plant to keep them looking good. When planting out or potting on in late winter or spring incorporate slow release fertiliser at recommended rates. This will get the plant away to a good start. Once September arrives your plant will be growing well. A soluble high nitrogen fertiliser applied every three of four weeks will keep the plant in top condition. When hand watering make sure that the soil ball is saturated. Around December, when the plants are in full growth, but starting to look a little overgrown, a pruning followed by a new application of slow release fertiliser will result in bushy growth and bursts of vigour giving lots of new flowers. Trim back the longer branches just enough to bring them back in line to the sides of the pots. As the plants grow make sure that you keep the fertiliser up to them. ‘Picasso in Pink’ was bred in Japan by careful selection. In Australia it is marketed as one of the Happitunia™ series released to the market over the years since Aussie Winners was formed. Petunias are all inter-related through cross breeding over many years. Hybrid Petunias are so well known that they do not need describing. Original species are seldom grown now, they are all native to the southern parts of South America.